This bedroom community is home to a small business not only producing wonderful coffee, but with a wonderful mission and results. Meet western Iowa’s Jumpy Monkey! The brand was purchased by current ownership in 2003 with one thought in mind – to provide meaningful employment to individuals with disabilities. 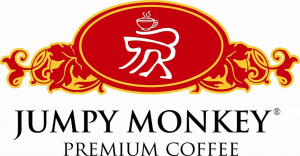 Now, Jumpy Monkey Premium Coffee is distributed by a growing network of non profit organizations sharing the kindred mission of unlocking inner potential through employment opportunity. Premium pork, sauces, and seasonings are also available to order, and we wanted to call your attention to one of Rube’s signature items, their skillet potatoes. 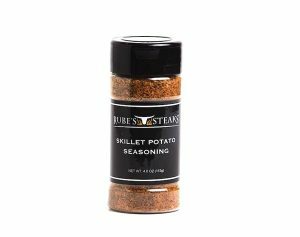 They’re nothing short of fantastic and now you can make them at home with a bottle of Rube’s Skillet Potato Seasoning. There’s nothing that goes better with a great steak than a savory side order of skillet potatoes! Mo’ Rub: This small Iowa company was founded in late 2011 by an Iowa wife and husband team with a signature product … Mo’ Rub. 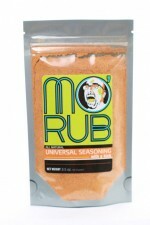 Mo’ Rub is a rub and spice mixture that’s good on any type of meat or fish. Rub it on before grilling, or sprinkle a bit on after it’s cooked. You can also use it various other ways, like as a dip. Mix it with a 16 oz. container of sour cream and you’re good to go! Mo’ Rub has a little kick but not too much to overwhelm the meat. Sprinkle it on to ground beef and you’ve got a tasty taco meat. Liven up roasted potatoes by misting it atop the potatoes before they hit the oven. If you’re not located near Guttenberg, contact the Market directly and they’ll arrange for shipping of select products – we recommend the popcorn and the Sweet Onion Peach Salsa! Guttenberg is a wonderful, friendly small river town featuring many welcoming businesses like the Clayton Ridge Farm Meat Market & Gift Shop … if you’re in the area, be sure to stop by and say hello! Butter Me Up Nut Butters: One of the joys of compiling State Gifts USA is coming across new small businesses providing healthy alternatives to mass produced products. Such is the case with this Cedar Rapids company, founded in 2013 by local resident Tracey Norman. Tracey was seeking out freshly ground nut butters as a healthy source of protein for her family … finding none locally available, she began to make them herself! Nut butters are similar to peanut butter, except these are made with healthy ingredients and no unnecessary additives and preservatives. Use them on traditional sandwiches, on crackers, toast, or even in recipes. Some of the flavors, like Dark Chocolate Hazelnut and White Chocolate Almond, are excellent choices for dessert – something a little sweet and natural! 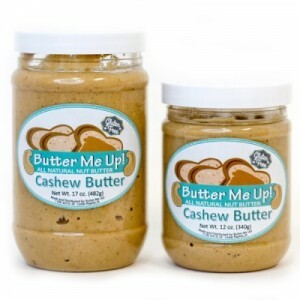 You can shop for these Iowa made nut butters directly at the Butter Me Up website. For traditionalists, Dry Roasted and Honey Roasted Peanut Butter are available too – taste the difference freshly ground makes vs. mass produced varieties. We’re anxious to follow this creative small company’s progress – Click through to learn more about them! This enterprising Iowa company got their start by marketing 100 bags of a homemade beer bread mix at a local craft show. It went over so well that they’re now in hundreds of retail outlets across the country … and the company has branched out beyond beer bread mixes. 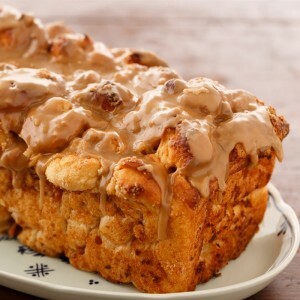 The Beer Bread Company creates beer cake mixes, hot and cold dip mixes, and of course their signature beer bread mix. 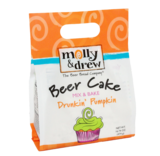 We particularly like their line of beer cakes mixes – all you need is an egg and your favorite beer and you’re ready to roll. For a special treat for company, try the Drunken Pumpkin Mix – it rivals any fresh bakery cake you’ll find! At their website, you’ll find a store locater feature where you can find the products near you. Or, shop online and order for yourself or as a cool gift! A very healthy product, Maasdam Sorghum makes the syrup directly from sorghum cane, without additives or blending. The cane grows prolifically in The Hawkeye State and is harvested when it’s about 15 feet tall. High in potassium, iron, and calcium, sorghum syrup is a shelf stable product that has been used in America for centuries. If you haven’t tried it, you should! It has a unique sweet taste without all the arificial ingredients you’ll commonly find in store bought syrup. Maasdam Sorghum ships their syrup in pint, half gallon, and gallon jugs and they’re also produced two helpful recipe books with hundreds of ideas for using this healthy sweetener in your every day cooking. You can even buy a batch of sorghum suckers (lollipops) … they’re delicious! Click through to their website to buy and enjoy a true taste of Iowa! Pepper Jams are available too, made with locally grown peppers. A gift of good taste is always welcomed! Barb’s Pantry: This small family owned and operated specialty jam company is based on an eastern Iowa farm where they make 30 different varieties of jams, jellies, and more. They even make and ship fresh made from scratch glazed apple cider doughnuts! 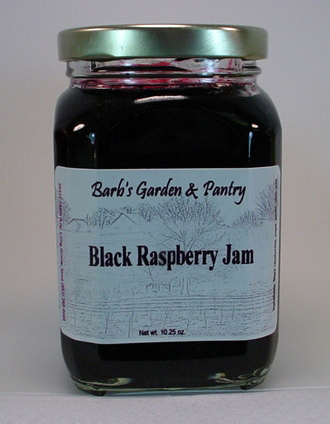 If you’re looking for fresh, natural jams in traditional flavors and some not often seen, check out the Barb’s Pantry website. 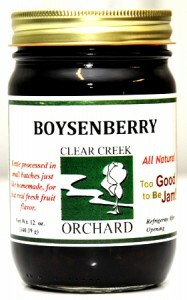 There you’ll find flavors like Black Raspberry, Gooseberry, Clementine Marmalade, Rhubarb, Strawberry, among others. One of their combination jams is really something – it’s called Fruits of the Forest and contains blackberries, red raspberries, apples, strawberries, blueberries, and rhubarb. Wow! You can order any of these jams by the jar and they’ll ship right to your doorstep. Jellies and sugar free fruit spreads are available too. And don’t forget the doughnuts! 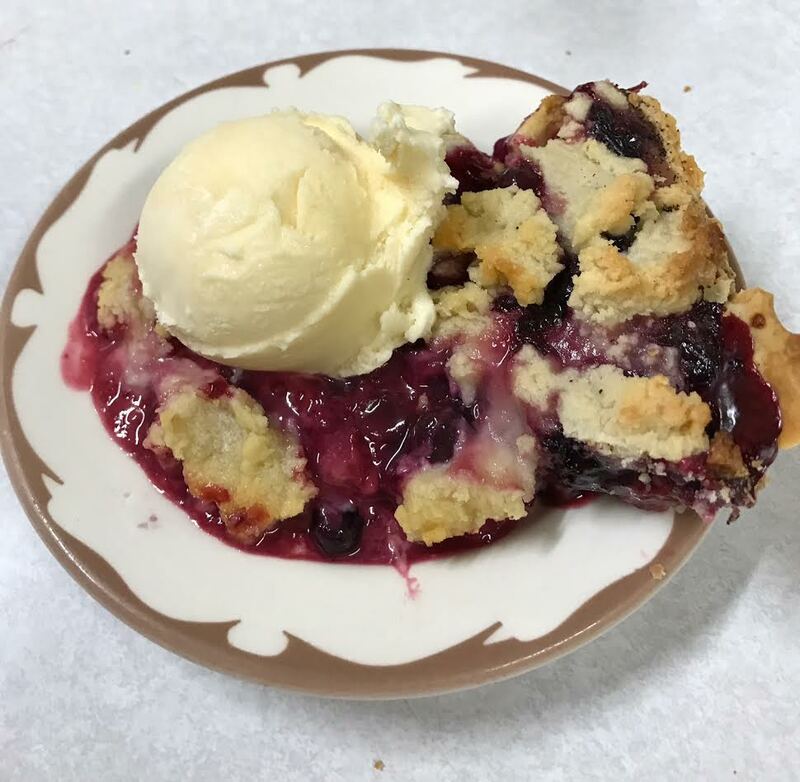 Click through to the Barb’s Pantry site – fresh from eastern Iowa! Laura Soybeans: From the heart of the midwest soybean country, Laura Soybeans are harvested and packaged right at the Chambers Family Farm in the small village of Corwith in the north central part of the state. They sell soybean snacks and whole soybeans which can be used to make soy milk at a fraction of the cost of buying it in the store. Their signature product is called Tosteds, a crunchy 100% roasted crunchy snack that’s very high in protein. 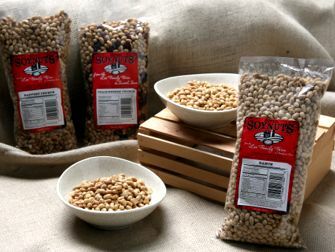 They can be eaten right out of the bag or used in a variety of recipes, many of which you’ll find at the Laura Soybeans website. The company also makes a trail mix using roasted soybeans called Tosted Trail, which includes a blend of bananas, blueberries, cranberries, and dark chocolate. Healthy and delicious! If you consume soy milk for dietary reasons, you can order not only bulk soybeans but also soy milk machines to make the milk yourself. The net cost for making soy milk versus buying it in the store is about a $5 per gallon savings! Check out all the Laura Soybean products at their website. Fresh from the farm in Iowa! Located in the small city of Ankeny just north of Des Moines, Brandmeyer Popcorn produces two brand names you’ll see on the shelves of stores in the Midwest – Lotta Pop and Iowa State. Made from Iowa corn, the popcorn is available from their website in unpopped packages or ready to eat in a wide variety of gift tins and specialty boxes. 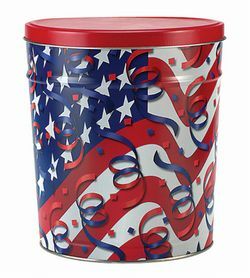 Many of the tins, like the one shown, are decorative and make ideal major holiday gifts! The company also offers popcorn in various gift size quantities, like two bag, three bag, and six bag boxes. 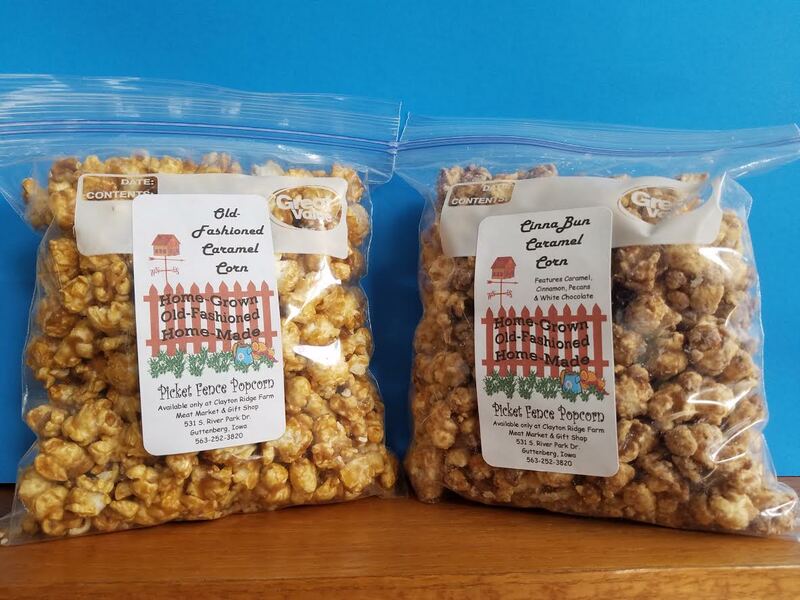 Just about ten blocks up from the riverfront area, you’ll find a charming little popcorn shop called Freddie’s Popcorn on Main Street. Their popcorn is carried at several local stores and the owners are consistent participants at the vibrant Dubuque Farmers Market. At their shop, you’ll find well over two dozen flavors of fresh Iowa popcorn, gift sets, and tins for any occasion. Have you ever met anyone who didn’t like a gift of popcorn? We haven’t either! If you can’t get to Dubuque, Freddie’s will ship many of their popcorn products directly to your door. Visit their website to learn more about them and to place an order! Dan’s family has a long history making maple syrup in this part of the country and the tradition continues. Their pure syrup, maple cream, and gift baskets are marketed at area farmers markets and at their online store. And if you thought all maple syrup is the same, you should know the syrup offers a different flavor profile depending where it’s sourced. Similar to honey and wine, the type of maple tree as well as other important environmental factors help dictate the syrup’s flavor. 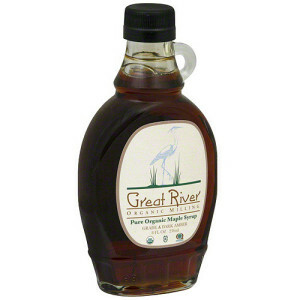 The bottom line is, if you enjoy maple syrup as we do, try as many as you can from all different parts of the country! 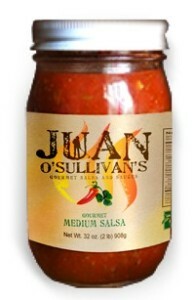 All in all, Juan O’Sullivan’s makes six different varieties of salsa and sauces, including a Gourmet Enchilada Sauce for all the culinary types out there. Check their website for more details on each of the salsas. You can order single jars or better yet, combination packs so you can enjoy all the flavors! 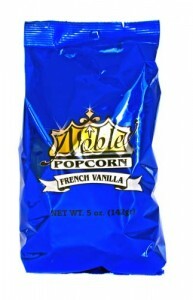 Noble Popcorn in a specialty tin is a very popular gift from the Hawkeye State. It’s available on their website in tins ranging from one to 6 1/2 gallons or by the single bag. 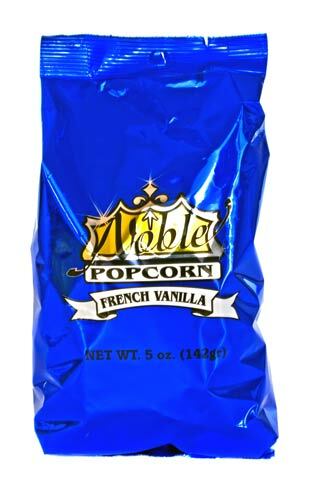 We really like their vanilla flavored popcorn … sounds unique but tastes great! The company also does a lot of private labeling and fundraisers and sells unpopped corn and popcorn accessories. If you’re stuck for an Iowa themed gift idea, Noble Popcorn’s website is a good place to start! We recommend their pumpkin fettuccine, which is great simply tossed with a bit of olive oil and served with a glass of Iowa wine! Krogh Family Farms Corn Cob Sweetened Spread: Now here’s an interesting product you’re bound to like … it’s a sweetened spread made from corn cobs! The product of Krogh Family Farms in Atlantic, IA, this spread is just like a jelly except it’s made from corn cobs. They also make a corn cob maple syrup! The spread can be used on anything one would normally use jelly on … toast, muffins, scones, bagels, and so on. 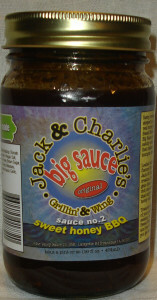 It’s also excellent as a dipping sauce or as a glaze for pork and chicken. You can order Maid Rite Party Packs and logo apparel at their online store. The Maid-Rite party pack is a great idea if you’re throwing an Iowa themed party. Just add ground beef! 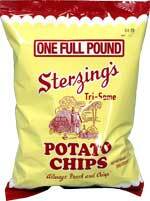 Sterzing’s Chips of Burlington, IA fit the bill … they’ve been around since 1933 and are still locally owned and operated. More importantly, they’re excellent chips! Sterzing’s has a long standing tradition of sending their chips to service men and women stationed overseas, a practice which began in the 60’s. 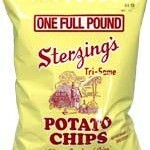 You too can have Sterzing’s Potato Chips shipped to you, or to someone special as a gift. Be sure to check out their sour cream and onion dip and cool yellow t-shirts too! Maytag Bleu Cheese is probably the most sought after bleu, and if you’ve never tried it, it’s something you simply must do … even if you don’t like bleu cheese, chances are the Maytag variety will change your mind! Soy nuts are loaded with fiber and protein … they’re also very low in carbohydrates, sodium, and calories. The fat content in soy nuts is low, and it’s monounsaturated (the “good” fat). Plus, soy nuts are a very dense snack food … just a few hand fulls will leave your hunger satisfied, and they provide a great energy boost! Nick’s Sticks are just like jerky, but without all the artificial ingredients often found in traditional jerky products. And they’re surprisingly healthy for you too! You can order Nick’s Snack Sticks online in packages of all beef, all turkey, or a combination of the two. There’s even a “Nick’s Sticks Club”, where you’ll be shipped a new batch of snack sticks monthly (a perfectly outstanding Iowa gift idea!). Milton Creamery: Milton Creamery in southeast Iowa is owned by the Musser family, who began dairy farming in this part of the state over 20 years ago. Herds of cows are managed and milked by the immediate family, and never given any growth hormones. From the best cows come the best milk, and from the best milk comes the best cheese! 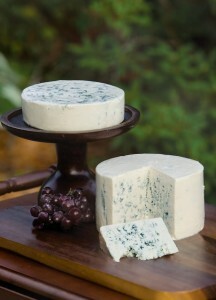 The Milton Creamery evolved from the farm and has produced award winning cheese since 2006. You can buy Milton Creamery cheese online and have it shipped overnight. 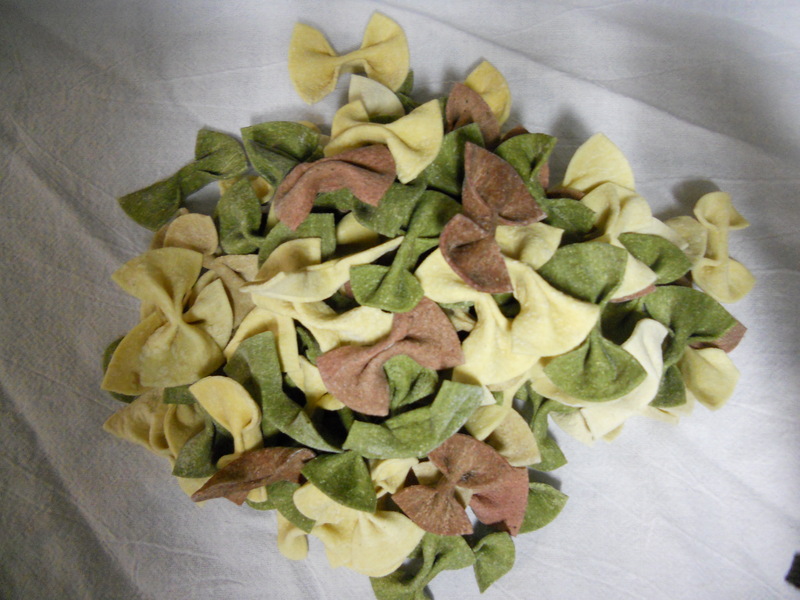 Two different varieties of special recipe cheddar are available in a variety of sizes. The company offers several series such as the Proverb Series, Touches Series, and the Stockholm Series. Check out the entire line of books at PenfieldBooks.com . In addition to books, the company also produces ethnic magnets and postcards. A selection from Penfield Books makes a great gift for any occasion! We love the Market Place’s showcase of Iowa made specialty foods – you’ll see dozens of local delicacies you’d be hard pressed to find elsewhere. Small batch breakfast and dessert syrups, local jams, mustard and sauces, and delectable artisan chocolates are among the large selection. Hosting an Iowa themed party or tailgate? Show your state pride with appealing logo items as well as dips, salsa, and popcorn treats that’ll make your gathering one to remember! 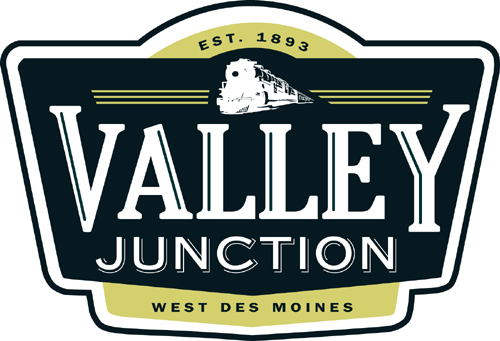 Even if you can’t make it to their physical location in Historic Valley Junction, click through to visit them online and Kelly will ensure your order is shipped right to your door! For All Things Iowa, shop the Heart of Iowa Market Place and savor some of what makes The Hawkeye State special! Best of all, candles make wonderful gifts for any occasion. Milkhouse candles are made in dozens of scents, and in unique containers that serve as impressive accent and home decor pieces. When you visit their website, check out the Creamery Collection … you’ll find long lasting candles poured into vintage style milk bottles, butter crocks, and more. Clever and fun! You can find their beautiful candles at many specialty and gift stores across the country, but for easier shopping, check them out online. Sure to be appreciated gifts from northern Iowa! For those who can’t visit the Amana Colonies in person, you can always visit the Amana Shops, an online outlet. 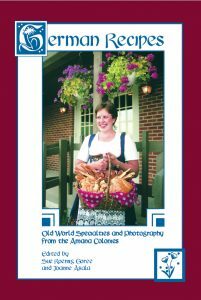 Featured here are the Amana Meat Market, the Amana Furniture and Clock Shop, the Amana Woolen Mill, and the Amana General Store. It’s the next best thing to being there! 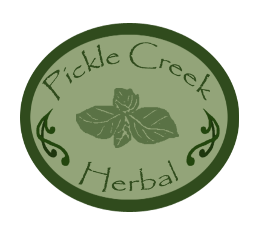 Pickle Creek Herbal: Pickle Creek Herbal is a family owned herb farm in Brighton, IA who create a variety of artisan products from the farm’s output. Everything is done by hand, from planting to packaging. Some of the specialty olive oils you can buy from Pickle Creek Herbal include Greek Basil and Garlic, Basil and Roma Tomato, and Greek Oregano and Garlic. They also make a sweet tarragon infused white wine vinegar, great on salads and sauces or as a marinade … check their website for the full product selection. A great “From Iowa Soil” gift! They make socks for members of the armed forces, sports and performance socks, women’s and children’s socks, John Deere license socks, and … well, you get the idea. Any type of socks you need for everyday use, you’ll find them online at the Fox Sox online catalog. You can even buy a sock monkey, which was invented by the company! We’re seeing more and more of this kind of handiwork and we love it. Reuse, recycle, and upcycle! You can order items like these at the Upcycled Style online store … there’s a great selection and prices are really reasonable. 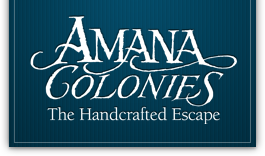 One reason why the Amana Colonies are so popular with visitors is the opportunity to purchase handcrafted furniture, functional home decor, and household items like those offered at Broom and Basket. You can buy brooms of all styles and sizes, as well as willow baskets and reed baskets. The Rada Kitchen Store is a great place to shop online for steak knives, bread knives, carving knives, kitchen utensils, and more. Cutlery gift sets are available, as are handy little knife sharpeners … which every home chef should own! 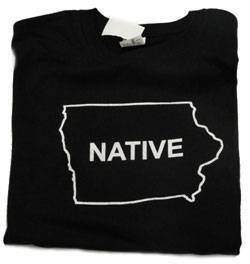 Native Iowan T-Shirt: What better gift to give a person born in Iowa than this t-shirt that says it all in one single word? This comfortable all cotton t-shirt is available in all sizes at Iowan.com and there are several other good looking designs too … for men, women, and children. We’d imagine anyone born in Iowa who wears t-shirts would like this one … it’s a clean and clear message of Iowa pride! 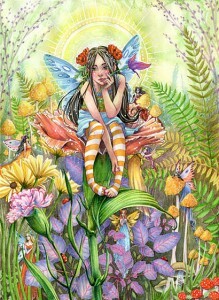 Sara specializes in fantasy genre drawings, like the beautiful print shown. She is passionate about connecting with the younger community through art and is a sought after commissioned artist and presence at many regional events. 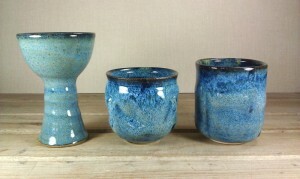 Visit Sara online and help support talented local Iowa artists! Locally created art is one of the best gifts you can give … it’s also a great way to remember your personal travels and decorate a special room in your home. Support your local Iowa artist! 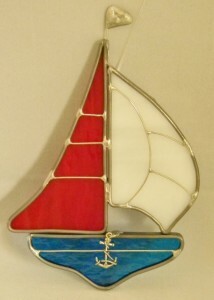 In addition to sun catchers, Patti creates fireplace screens, lamps, night lights, window panels, and more. Check out her Crafti Critter Creations website to learn more about her and her work. Geode Jewelry: Geode is the state gemstone of the Hawkeye State, and what better Iowa gift to give to someone special than a beautiful piece of jewelry incorporating the state gem? Erin Schmitz of Calamus, IA offers pendants, earrings, and more stunning jewelry directly from her online shop. 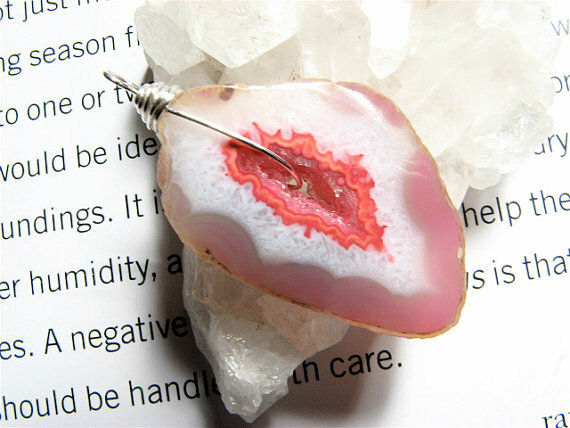 Many, like the one shown, are made incorporating geode. There are numerous other precious and semi precious stones Erin turns into functional jewelry, like agate and amethyst. 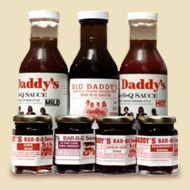 Big Daddy’s BBQ Sauces: If you’ve spent any time in Iowa, you know it’s quite a barbecue state. There’s all kinds of great BBQ restaurants tucked all over the state, and Iowa raised pork is acclaimed nationally. On our recent visit to Des Moines as part of our “Visiting America’s State Capital Cities” feature, we discovered this company’s sauces at the local farmers market. Big Daddy’s used to be a popular restaurant in the city, but now the family has carried on the sauce making of the late Ike Seymour, the original Big Daddy and a local barbecue legend. The sauces are available at the famous Des Moines Farmers Market (one of the country’s largest), or online at their website. Several varieties are available, from Mild to Lava Q, a hot number that’s exceptionally flavorful. There are also some special blends available only online, so click through to learn more. Big Daddy’s also does catering, so if you’re in the capital area, check out their services! Gee Daddy’s BBQ: We love good barbecue and make it ourselves as often as we can. 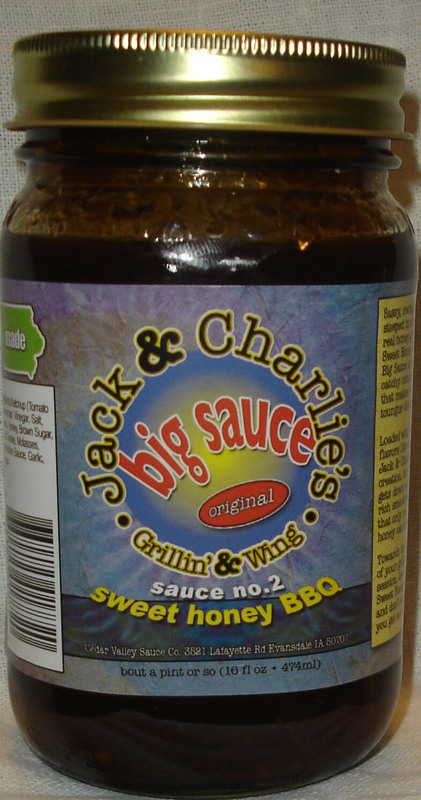 And whenever we find a truly exceptional barbecue sauce, we love to talk about it! 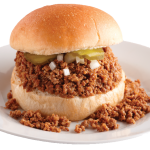 With that in mind, we’re happy to introduce you to Gee Daddy’s BBQ of Centerville, IA. A friend of ours does business near the town, located in the extreme southern part of the state just a few miles from the Missouri border. 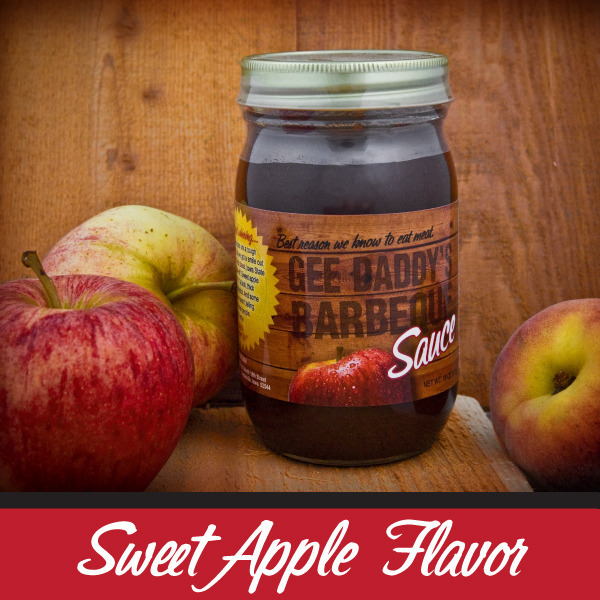 He brought us back a jar of Gee Daddy’s Sweet Apple BBQ Sauce and we loved it! The owner of the company, Jon Schmidt, was inspired by an Iowa tradition to create the recipe. Very often when a pork dish is served in The Hawkeye State, a cup of applesauce is served along side for dipping. Putting two and two together, Jon developed his recipe and it’s a winner – it not only pairs well with anything pork, but chicken as well! Gee Daddy’s also offers an Original flavor and an all purpose rub – you can buy them directly at their website in 18 ounce jars or gallon containers. Great stuff from a great barbecue state! Cookies makes four types of barbecue sauce, a hot wing sauce, salsa, taco sauce, and more. 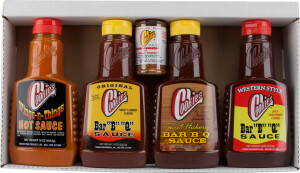 We bought a bottle of each of their bbq sauces … thick, rich, and savory! We particularly enjoyed the Sweet Hickory variety, which offers a bit of sweet along with the barbecue hickory tang. Cookies also makes an Original and Western style, as well as a Country Blend. They’re reasonably priced and very good! You can buy any of these sauces or other Cookies products directly at their website. They’ve got a handy gift box available which contains five of their products – an ideal sampler for the BBQ lover in your life! Visit the Cookies site for more details and get your “Q” on! You’ll find four different sauces available for purchase on their website, starting with their Roasted Garlic BBQ sauce, which features medium heat. Sweet Honey BBQ is the sauce we tried recently – it has a medium spice kick rounded off very nicely by the addition of honey. Baste this sauce on as you grill and you’ll get a wonderful glaze on your ribs! 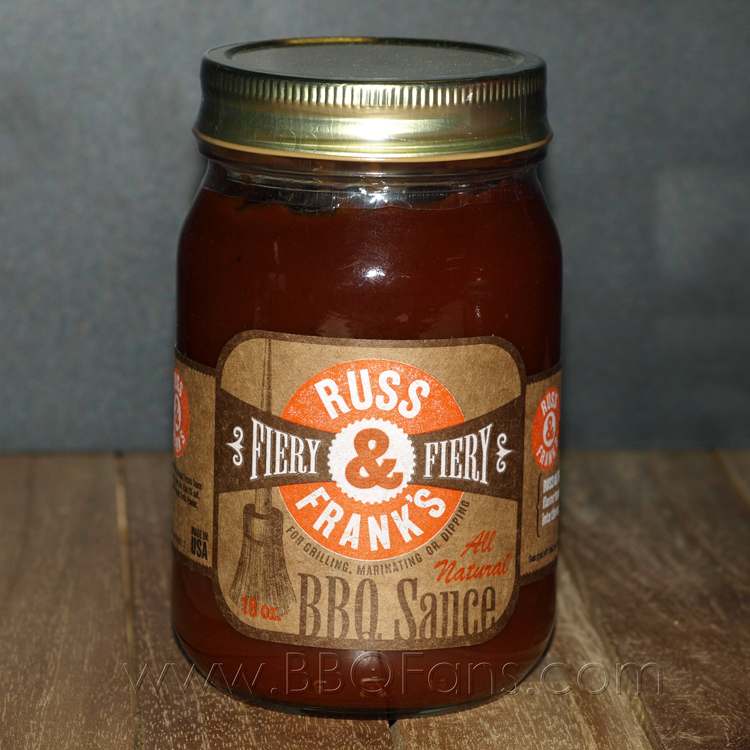 It’s Russ and Frank’s BBQ sauce, made by a Des Moines area company. They offer a spectrum of flavors, from Mild to X-Fiery. 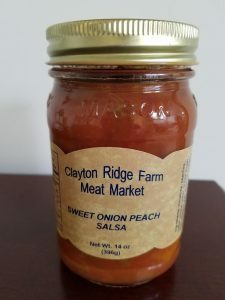 Iowa is known for their great pork products, and this stuff is wonderful on chopped or pulled pork … or any pork dish for that matter! 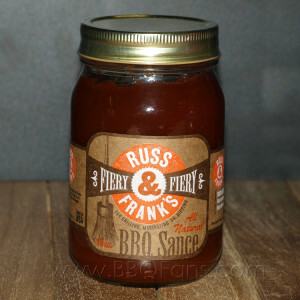 Pictured is Russ and Franks Fiery BBQ Sauce. It’s one of two we tried, the other being our favorite, called Sassy. All in all, there are four different heat levels, so no matter how hot or mild you like your sauce, Russ and Frank’s have you covered! 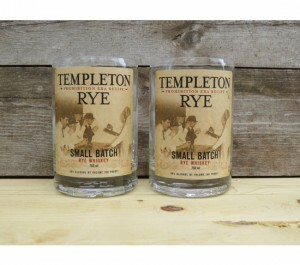 You can order directly from their website in pint jars or gallons. We brought home a couple of jars and recommend going with the gallon size … these sauces are great! A few other delectable treats the company makes are Cashew Gremlins, which are best described as a chocolate covered nut cluster, and toppings like Caramel and Fudge for all you ice cream fans. Everything is hand made the old fashioned way – a real treat from Dubuque and The Hawkeye State anyone will appreciate! We really hope you get to visit in person, but if your travels don’t take you to Dubuque, check out their website and place an order for yourself or as a gift. They ship nationwide and were awarded the honor of “Best Culinary Gift Made in Iowa” by People Magazine. Enjoy! Jaarsma Bakery also specializes in candy – check their website for cashew clusters, peanut clusters, and a unique treat called Coconut Bliss. They’re coconut macaroons covered in milk chocolate! If you’re near Pella, stop by and pay them a visit six days a week. They’re also got a location in Oskaloosa making the same wonderful baked goodness. You can also order many of their products directly online at their website – click through to see all they’re doing! They’ve probably best known (regarding candy making) for their Trappistine Creamy Caramels. These caramels come in several varieties, either individually wrapped or coated in light or dark chocolate. 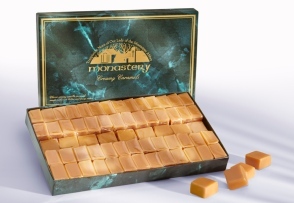 Monastry Candy is much more than caramels, though. The nuns also make meltaways, mints, truffles, topping sauces, and maple syrup! In addition to honey, Spring Valley Honey Farms creates a line of bath & beauty products like Hand & Body Lotion, Lip Balm, and Lotion Bars. They also make beeswax candles, including the very cool corn cob shaped candle shown. It’s the perfect Made in Iowa gift! You can order their honey and any of the honey and beeswax based products directly at their website linked above. Locally made gifts from the heart of The Hawkeye State! We love trying honey from different locations around the country. Many people think all honey tastes the same, but it doesn’t! The flavor profile of honey is directly related to the flowers the bees pollinate. 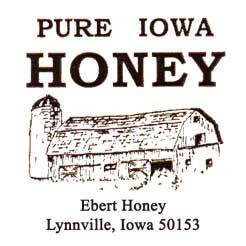 In the case of Ebert Honey, their base in central Iowa between Iowa City and Des Moines offers quite a bit of clover. Clover honey is one of the best tasting you’ll find – it has a light color and a pleasant, sweet taste. You can buy their honey at their online store, where you’ll also find pure beeswax, packaged bee pollen, and beeswax candles. A really wonderful local gift from The Hawkeye State! 8). Iowa has the highest high school graduation rate of any state in the country, hovering at just over 90%. Traveling America’s Heartland is a joy in any season, but particularly in early summer. Flowers are blooming, outdoor patios are bustling, and locals are shaking off the effects of the preceding months. A journey on Interstate 80 is like a pilgrimage to America … you’ll experience cities, small towns, and the vast bread basket region teeming with farms and open space. Our history with Des Moines dates back many years, decades in fact. My mom and dad moved our family for a year to Denison in the western part of the state when I was a first grader. We passed through Des Moines lo those many years ago and have been back to visit several times on our travels. 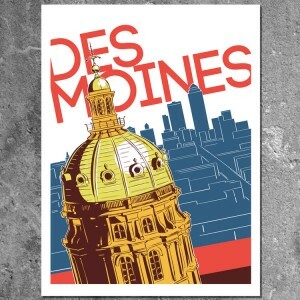 If you’re anywhere in middle America, Des Moines is easy to reach. 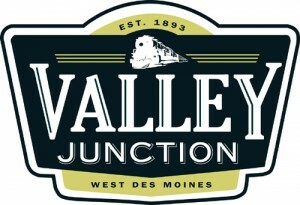 It’s located in the heart of Iowa, at the intersection of two major interstates – I-35 and I-80. 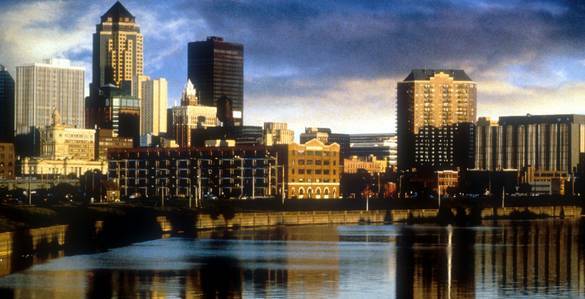 A perfect overnight stop on a cross country journey, the capital city of Iowa offers an abundance of reasons to stop and linger. Des Moines is a river city – directions and city lingo tend to focus on locations adjacent to or in directions from the two rivers (Des Moines & Raccoon) which meet here. The city drew its’ name from the Des Moines River, which translates to “river of the monks”. 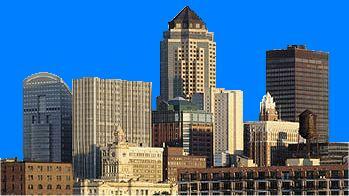 The city is an insurance industry hub, with many large companies either headquartered or with a major presence here. When you arrive in the city either on I-80 or I-35, the first landmark you’ll notice is the gleaming capitol building dome, which rises 275 above street level. It’s located on the eastern side of downtown at the terminus of an area known as East Village, which we’ll delve into shortly. On this trip, we spent the better part of two days here before heading west to Nebraska and Kansas. 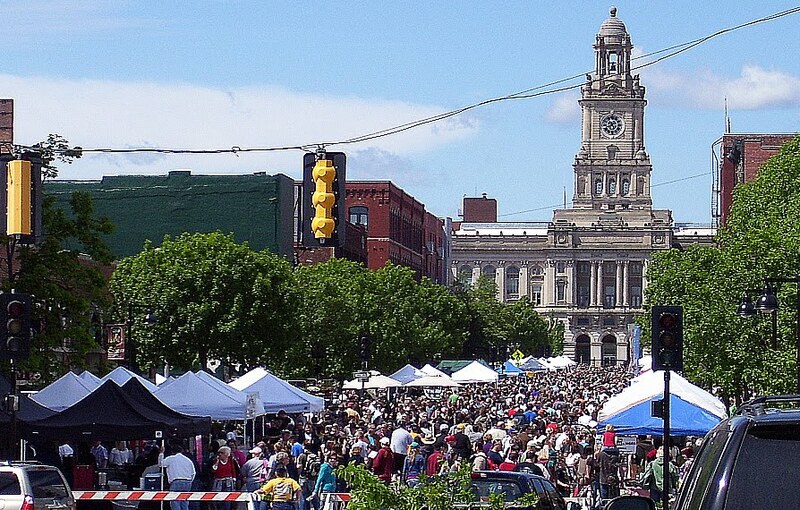 We did a ton of walking – we encourage you to explore the city on foot – and got to experience the downtown farmers market, said to be the 2nd largest in America and quite an enjoyable spectacle. We also enjoyed visiting the capitol and soaking in two of our favorite Des Moines neighborhoods – the East Village and the Court Avenue District. We were lucky enough to pull into Des Moines early on a Saturday morning, with ample time to explore the fantastic farmers market. These markets are always a treat for those who enjoy fresh local produce and small independent businesses showing off their wares, but this one is really something special. 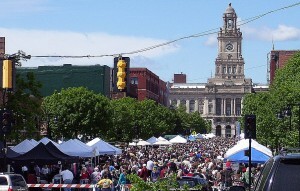 The market is held in and around the Court Avenue District, which is the city’s center of dining, entertainment, and nightlife. 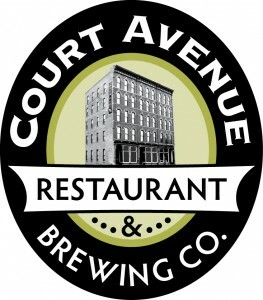 One of our long standing Iowa favorites is located here, the Court Avenue Brewing Company. This place always makes our list of favorite places to eat, and the historic building it’s housed in dates back to 1881. There’s plenty of live music in the vicinity and open air is the rule of the day. Walking along Court Avenue in the evening is a Des Moines right of passage, with outdoor patios and open doors & windows beckoning passer by’s in for a drink or a meal. Shops abound too, so don’t miss exploring this area! 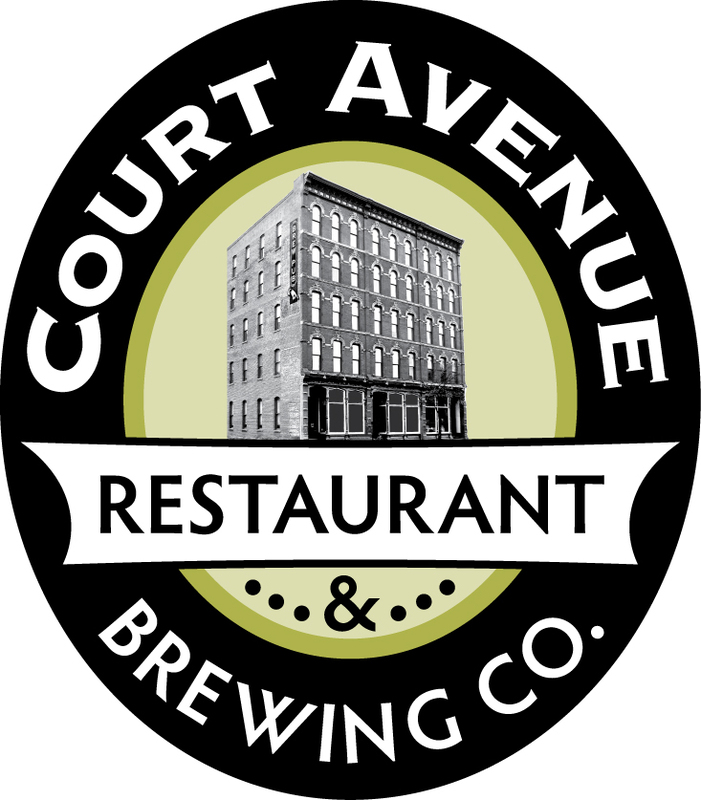 We recommend hitting Court Avenue late in the afternoon to give you plenty of time to explore, enjoy happy hour, then dinner and music. 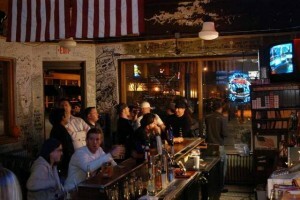 Another area downtown to add to your agenda is the East Village. So named because it’s immediately east of the Des Moines River, it’s accessible over the Court Avenue, Locust Street, or Walnut Street bridges. 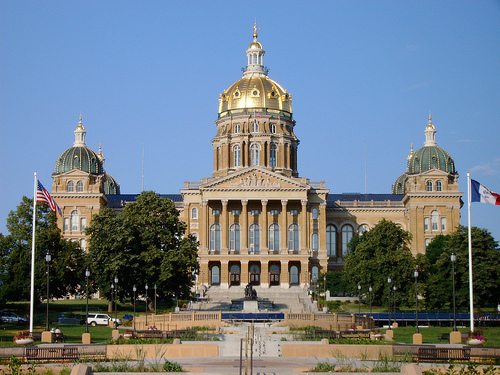 Located at the east end of East Village is the Iowa State Capitol Building (you can’t help but see it), surrounded by its magnificent grounds and gardens. East Village is as much a neighborhood as it is a dining and entertainment destination, and that’s what makes it so appealing. There’s a real vibrancy to the area and it’s an ideal place for a stroll. We walked through it to tour the capitol, and then strolled back through to check out all the happenings. And one of the biggest happenings in the East Village is the shopping – if you like small independent businesses like we do, don’t miss this area! Just a few of the shops we visited while here are From Our Hands, a fun multi dimension craft gallery, and Green Goods For The Home on Grand Avenue. There are probably two dozen places to shop in the area, plus all kinds of places to eat and drink too. The East Village comes alive later in the evening – it’s a gathering place for young professionals (and not so professionals) for live music and late night bar hopping. If you’re a fan of old saloons and dive bars, one of Des Moines’ best is on Locust Street – The Locust Tap. It’s been around since the 1930’s and is one of the city’s oldest bars, if not the oldest. It was closed for a while but recently underwent some repairs, such that they are, and having a cold beer or two here is a central Iowa must! At the eastern end of downtown is the Iowa State Capitol. You can see the tall gleaming gold dome for miles around, and it towers over the East Village landscape. The building was completed in 1886 and tours are offered Monday through Saturday. Take a tour and you’ll see numerous works of art, all sorts of beautiful colored marble, and handsome wood and stone carvings. The surrounding grounds are equally impressive, and it’s an easy walk back to the heart of the East Village. As we mentioned, Des Moines is a great walking city. If the weather is nice, be sure to take advantage of strolling along either of the two rivers downtown. The riverwalk system is continually expanding and there are lots of green spaces to enjoy some peace and quiet. One of our main reasons for stopping in the city this time through Iowa was to finally visit a few restaurants we’d been wanting to hit for years. We love putting the guide books aside and checking out places featuring regional specialties or twists on all American classics. We only had two days, but brought along our appetites and sampled quite a few! Near the top of our to do (to eat??) list was Gusto Pizza, a casual & inexpensive place on the western edge of downtown, a block north of Grand Avenue. Rated as the best pizza in Des Moines and boasting some recent national press, this place serves fantastic pizza with creative (but not weird) topping combinations. We ordered their Spartacus Pizza, loaded with locally made Graziano sausage (more about them in a minute), mozzarella, and banana peppers. They serve sandwiches and salads here too, but go for the pizza, it’s one of the better ones we’ve had! 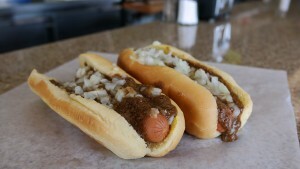 Another casual Des Moines classic is George The Chili King, an all American style place serving burgers, hot dogs and of course chili in a diner and car hop setting. Great for families, this place has been around since the early 1950’s and if you like Coney dogs (hot dog with chili and cheese), don’t ask questions, just stop here! Even if you’re not hungry, the shakes are fantastic too – try the strawberry or cherry. We loved it here – a really cool traditional place in the city with good food where you won’t break the bank! In the East Village, stop for a sweet treat at the creative Scenic Route Bakery, and while you’re in town, stop on the south side’s Union Street to visit Graziano Brothers market. It’s less than five minutes from downtown and their delicious Italian sausage is served at restaurants all over Des Moines. 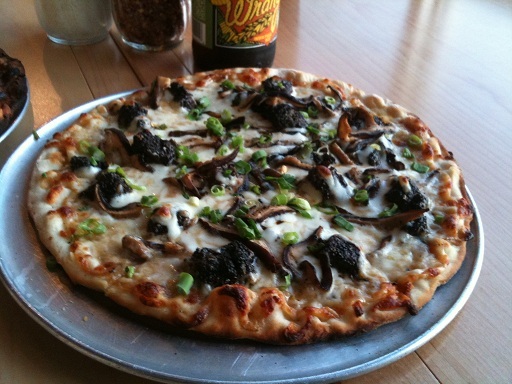 We were sold the instant we tried it at Gusto Pizza, and made it a point to visit. Graziano Brothers has been around since 1912 and you’ll find a wide array of house made sausages, cheese, meat, pasta, and desserts. Try the Medium Hot or Sweet Italian Sausage – we can’t decide which one we like better! 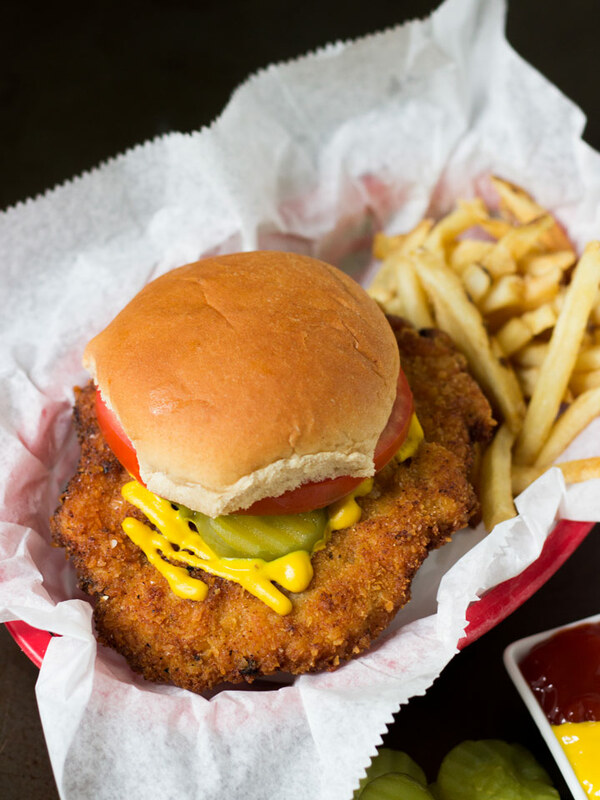 Bottom line … if you like to eat, you’ll love Des Moines! Whatever you like to see and do on your long weekends, Des Moines has it! Anywhere you live in middle America, this city is within easy reach. The people are friendly and there’s a small town vibe you’ll notice wherever you go. We loved visiting here and we’re confident you will too! For more in depth information about Des Moines, including where to stay and attractions in and around the city, visit the very helpful Catch Des Moines website. There you’ll find the latest edition of their visitor guide, helpful maps, suggested itineraries, and much more.